In my searches for known family, I keep turning up Hasselbachers about whom I know nothing. I am in hopes that some one will find their way here and help me out. Here is a perfectly straightforward 1910 census report for the butcher Alexander Hasselbacher of Germany and his family. He was born around 1865, immigrated in 1880, and married an American-born woman about 1889. His wife is Anna, and their children are Alexander (also a butcher), Anna, and Bertha. Living in the same house is Francis Maier who also immigrated from Germany in 1880. The house is 488 Bergen Rd. in the City of Newark. 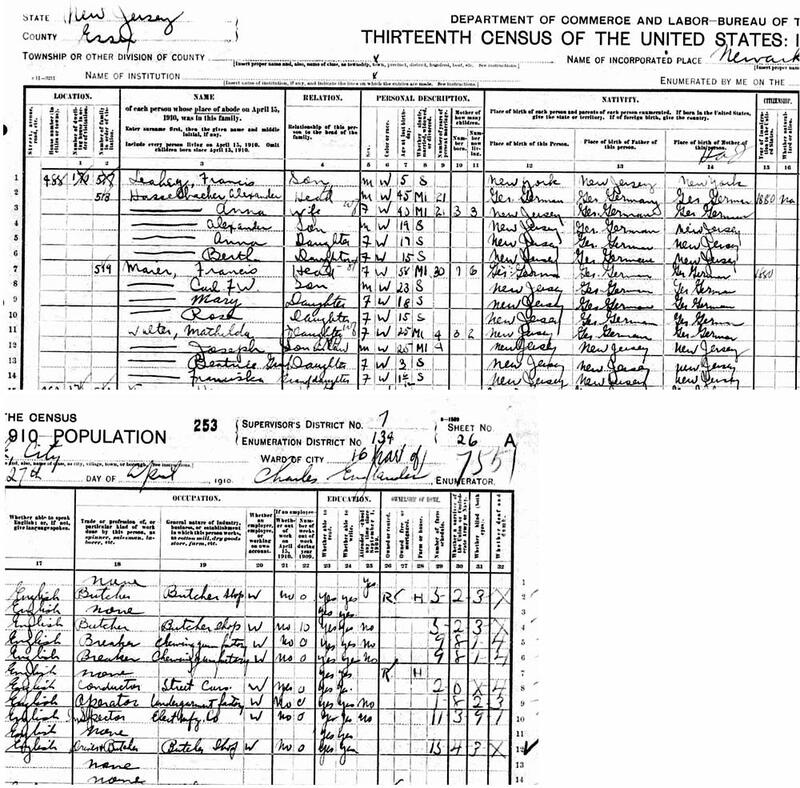 I also found census reports for 1900 and 1920. The name was spelled Hesselbacher in these two latter reports. As is often the case, some of the other details are off a little. In 1900 Alexander immigrates in 1833, born Oct 1865, and had been married 10 years. He was a provision dealer and was living on Montgomery St. In 1920, Alexander and Annie were living alone on Linden. Alexander was 53 and had immigrated in 1882 from Germany/ Bretton. If anyone wishes to see these last two census reports, let me know.